During the Golden Age of Baseball you would often find the brightest stars of the game promoting every product imaginable on print, radio and television. Fortunately, much of those efforts remain memorialized as collectibles from the period. There are cardboard ad signs, pins and cards of your favorite players available for just about every consumer good on the market. Best yet, some of the television commercials from the period can now be seen on YouTube. Featured here is something that melds both the memorabilia aspect with an actual television commercial that you can still watch today. 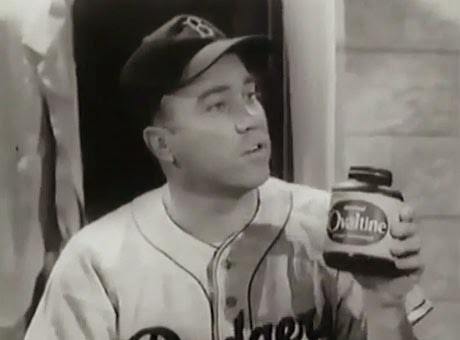 I recently came across an old copy of an advertising agency storyboard for a commercial that featured Dodger great Duke Snider selling Ovaltine powdered chocolate milk on eBay, and knew I had to share it here. Check it out above and below. The commercial features Captain Midnight, originally a radio serial superhero, giving a young lad a tour of the "Secret Squadron Hall of Fame." The kid is introduced to such sports greats as "Crazylegs" Hirsh of the LA Rams, champion swimmer Florence Chadwick and finally slugger Duke Snider. Unfortunately, it's tough to tell what exactly the storyboard and attached script says, but we can watch the final product via Classic TV Commercials on YouTube. Check it out below.